New Stone Circle Discovered ? 1000’s years older than Stonehenge. 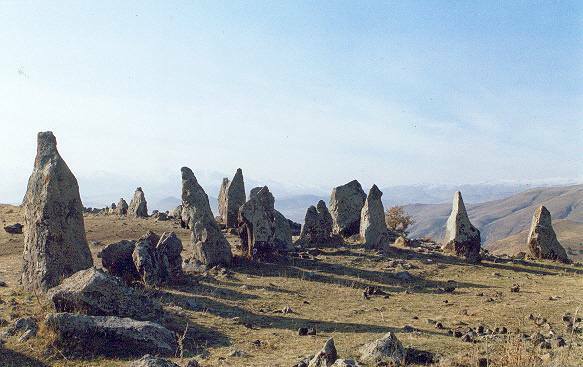 A stone circle located high in the highlands of Southern Armenia may in fact be the oldest stone observatory in the world, predating England’s Stonehenge. According to newly started excavations, the Armenian Stonehenge (Karahunj) has a history of 7500 years. It’s discovery has sparked a scientific debate in astronomical and astrological circles. Yerkir Media’s Gayane Avetisyan reports on the story for CNN World View. A new study into Armenia’s Carahunge stone circle complex, has shown that it is arguably one of the oldest known megalithic sites outside of Turkey, dating to around 5500 BC. Moreover, investigations by Russian prehistorian Professor Paris Herouni indicate that Carahunge (car means “stone” in Armenian, and hunge means “voice” or “sound”), located some 200km from the Armenian capital Yerevan, not far from the town of Sisian, was created as an astronomical observatory marking the movement not only of the sun and moon, but also the stars. Indeed, Herouni’s work at Carahunge was impressive enough to draw in the expertise of the late Professor Gerald Hawkins, who was impressed by the thoroughness of the survey undertaken by his Russian colleague. More significant is that Carahunge’s principal stellar alignment is towards Deneb, the bright star in the constellation of Cygnus the swan. A number of the standing stones bear smooth angled spy holes that are 4 to 5cm in diameter, each one being angled towards different points on the horizon or ancient targets in the heavens. A key stone had a hole that was focused due north towards the meridian. This suggested that it targeted a bright star at its culmination – i.e. the highest or lowest point it reaches as it revolves around the north celestial pole. One of the holed stones at Carahunge aligned to celestial events and key stars. Herouni ran the angle of the stone through various astronomical programmes and found that it was aligned to Deneb at a date of around 5,500 BC, suggesting that this was the time frame in which Carahunge was in use by an advanced society of astronomer priests. It was this alignment that provided the key to finally dating the site, which was expected to have been constructed during this distant epoch. It is even now being claimed by Professor Herouni that Carahunge is the oldest stone obervatory in the world, although surely the stone setting at Nabta Playa in Egypt’s Libyan desert is at least as old as Carahunge, and arguably older. Plus there are my own findings with respect to the orientations of various Pre-Pottery Neolithic (PPN) sites in southeast Turkey, including the 12,000 year old Gobekli Tepe. In The Cygnus Mystery (2006) I demonstrated that, like Carahunge, they seemed to be orientated towards Cygnus’s brightest star, Deneb. The importance of Professor Herouni’s findings regarding Carahunge is that in a time frame little different to the Neolithic city of Catal Huyuk in neighbouring Turkey, there was an astronomical observatory in Armenia not just aligned to the sun and moon, but also to the stars, and Cygnus in particular. I suspect that the interest in this star group goes back beyond the PPN sites of southeast Turkey to the Palaeolithic age, and the peoples who created the amazing cave art in Western Europe. Representations of Cygnus certainly exist in the Lascaux cave in the Dordogne region of southern France, and I suspect it is present in various other painted caves as well. So why was Cygnus important? Primarily it is because of its use as a time marker, its stars being so close to the north celestial pole they move very little across hundreds of years. Then there is its position on the Milky Way, exactly where this starry stream bifurcates to form what is known as the Cygnus Rift or Dark Rift. Universally, this area of the sky has been seen as the point of access into the sky-world, as well as a place of cosmic birth and death. It was also the place where the souls of the dead travelled in the afterlife, very often accompanied by, or in the form of, a bird, seen as a psychopomp, a soul carrier. Very often the identity of these birds corresponded with how the stars of Cygnus were represented in regional mythologies – a falcon in Egypt, a vulture on the Euphrates and a swan in Hellenic Greece and Turkey. I am not surprised that Carahunge is aligned to Cygnus, although it is always pleasing when one’s theories are shown to be real. I think that in years to come we shall find a lot more about the cult of the swan, and its relationship to the earliest sky-religions of the ancient world. I also think there is much more to learn about the prehistoric beliefs of the proto Armenians, and how they held true age old beliefs that went back all the way to Palaeolithic times. Professor Herouni has published a book of his findings with respect to Carahunge. Entitled ARMENIANS AND OLD ARMENIA “, it provides compelling evidence that this impressive megalithic site of over 200 standing stones spread out across 7 hectacres, was constructed and used by an advanced civilization. The book provides a detailed explanation of how the stone monument works as an astronomical observatory, and explains its context as the foundation point of Armenia and Armenian history. 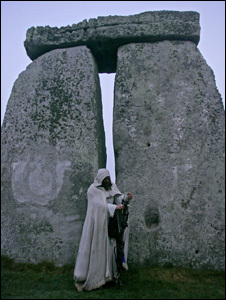 This may be 1000 years older than Stonehenge, but its still not as old as several stone rings and temple sites in Ireland,Brittany and a few in Scotland all proven to be astronomical observatories. Sorry the drift was toward the east from the west. Check the recalibrated radiocarbon dates for Brittany (5000 BCE) and you will see the origin point for this type of architecture. Look up Knowth, Dowth, Newgrange, Maes Howe, Arzon, Locmariaquer and Carnac to name just a few. This site in Armenia, does however fit the chronology for a diaspora out of Brittany in all directions 4000-3600 BCE, which implies an earthquake and tsunami in Brittany (Gulf of Morbihan) about that time.